Modifications to a Motorola Micor Compa-Station Unified Chassis for Repeater Controller Interfacing. These Mods have been successfully used in interfacing S-Com 5K's and 7K's to Motorola Micor Compa-Stations with a Unified Chassis. 3) IFR510 Power Mosfets - Radio Shack P/N 276-2072 or equiv. A couple strips of Double-Stick tape. Not necessary, but nice. A short length of small shielded audio or rf cable. About a foot of some kind of small insulated wire. The first thing you need to do, is make sure you have a working unit prior to doing any modifications. This will make life much easier if you need to troubleshoot something later. Also, if you don't already have one, get a service manual! Next if you have a unit that is configured as a Base Station, Tone or DC Controlled Remote Base, you'll need to modify the receiver interconnect board to allow DUPLEX operation. This is a very easy mod. Just get to the receiver interconnect board and remove diode CR 957. You can also get rid of ALL station cards/modules except the Station Control card. 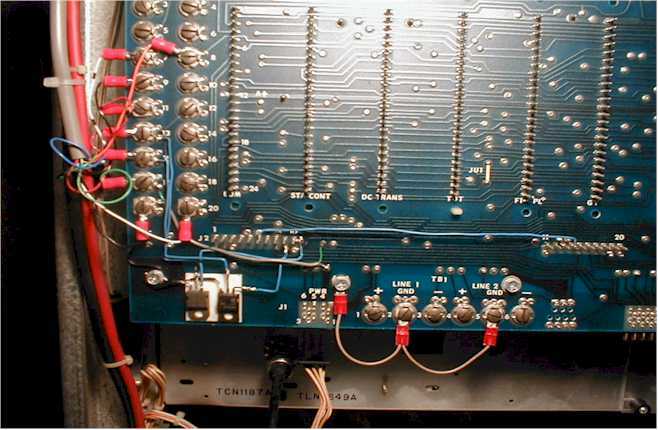 J2 on the backplane is the row of 30 pins in groups of 10 along the bottom of the backplane. These are the Receiver interconnect pins. 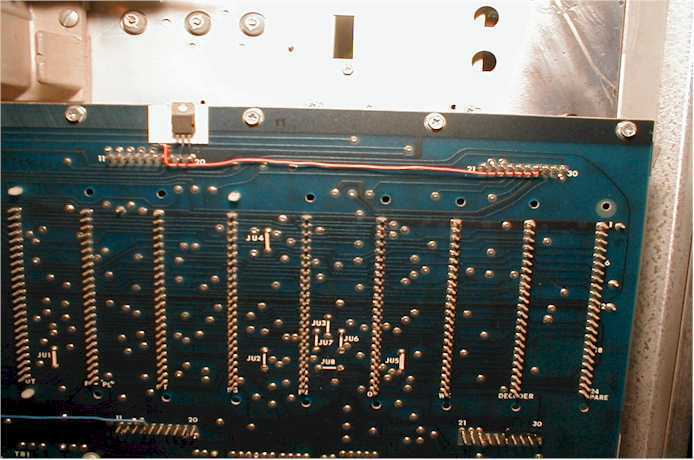 J5 on the backplane is the row of 30 pins in groups of 10 along the top of the backplane. These are the Transmitter interconnect pins. Install the following jumpers on the backplane using some insulated bell wire or whatever you have handy. At this point, with all cards removed except the Station Control card, your unit should receive and you should be able to hear audio from the local speaker. There are six Philips head mounting screws along the bottom edge of the backplane. 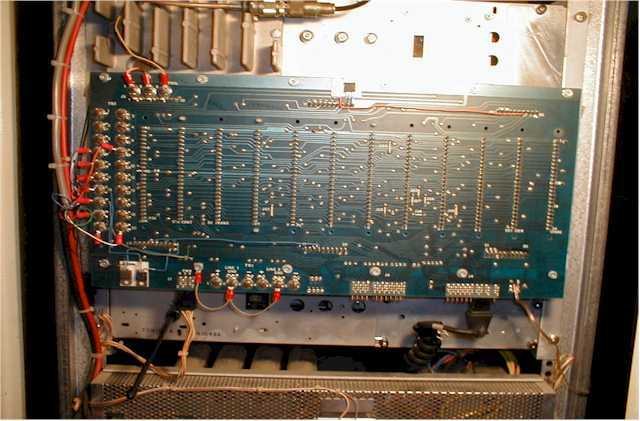 Looking at the lower left corner of the backplane, just to the right of the first mounting screw, you will see an area that is pretty clear of all traces. This makes a great spot to use some double-stick tape to mount two of the Mosfets. Mount two of the Mosfets on the double-stick tape with their legs sticking up. Bend the SOURCE lead of one Mosfet 90 degrees to the LEFT. Clip the GATE lead, where it widens to enter the body. Leave the DRAIN lead sticking up. Clip the SOURCE lead at the point it widens to enter the body. Bend the GATE lead 90 degrees to the RIGHT. These will be mounted on the double-stick tape and arranged so that the CLIPPED Leads are closest, and BENT leads are on opposite ends. That is, Mosfet #1 on the LEFT and Mosfet #2 on the RIGHT. I also use the large screws staggered vertically along the left edge of the backplane to interface the controller. There are several screw terminals that don't have any signals on them and with a couple jumpers, you can get all the signals you'll need. Install a jumper from TB3-19 to the mounting screw on lower left of backplane to establish a good ground. Locate J1, labeled as PWR next to the second mounting screw along the bottom edge of the backplane. There's a fairly wide trace that has the "R" from PWR with the "4" under it. This is a GROUND trace. You can meter it out with any other ground reference to make sure. Now, follow this trace up the backplane to where it ends at a feed thru rivet. It's a very short trace. It should be the Right feed thru in a set of three. DIRECTLY ABOVE this feed thru rivet are 2 more feed thru rivets. They just look like Dots of solder. The one on the LEFT is the point to get Disc Audio. There is NO trace coming from this point. Prepare a length of small shielded audio cable, or RG174 RF cable so that the center conductor can be soldered to the feed thru that has Disc Audio on it, and the shield can be soldered to the ground feed thru right below it. Install a line from J2-9 to the Gate of Mosfet #1. You've already connected the Source lead to ground. Install a line from J2-10 to Gate of Mosfet #2. Now to get the transmitter going. Take another piece of double-stick tape and mount it above J5 over pins 19 and 20. Take the third Mosfet and hold it facing you with it's leads pointing down and bend the GATE lead 90 degrees to the left. Leave the other two leads as they are. Now mount the third Mosfet on the tape so that the right lead (Source) can be soldered to J5-20 (Ground) and the center Lead (Drain) can be soldered to J5-19 (F1 TX Osc). Install a line from the Gate lead - should point towards the left - to J5-27 (Keyed A+). The third Mosfet allows the TX Oscillator to only be active during Transmit as opposed to running all the time. If you would like some Scom controller programming help, go to the Scom controller resource page.